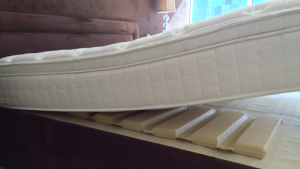 Mattress Helper patented sagging mattress fix is very proud to announce that it is now sold at Houzz.com!!! Houzz is the premium go to place for high-end design, remodeling and restoration ideas with a tremendous online presence. Why replace your soft or sagging mattress with another expensive one that will eventually sag too? No matter what type of mattress you own or how much you paid for it, they all will have that body impression or compressed area where you sleep night after night. Get that new mattress feel and look instantly and for a fraction of the cost with the Mattress Helper now sold on Houzz.com. The unique durable foam design of the Mattress Helper prevents pressure point pain of other hard solid products on the market which are placed underneath your mattress. Easy simple solution to a widespread problem of restoring firmness to a soft or sagging mattress. 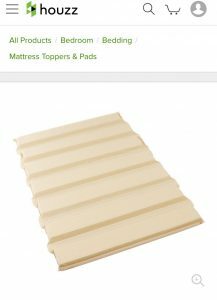 The Mattress Helper spacing between the durable foam slats allows the mattress above it to move and flex comfortably when you move. Sleep better for a fraction of the cost of a new mattress with Mattress Helper. Help your mattress feel newer again with the Mattress Helper! Now sold on Houzz.com.